Mother’s Day is right around the corner and I couldn’t help but put together a little something for the moms out there! I am so fortunate to have 3 beautiful, strong women as mothers in my life as well as numerous aunts, cousins and friends who are amazing mothers, soon to be moms and grandma’s!! 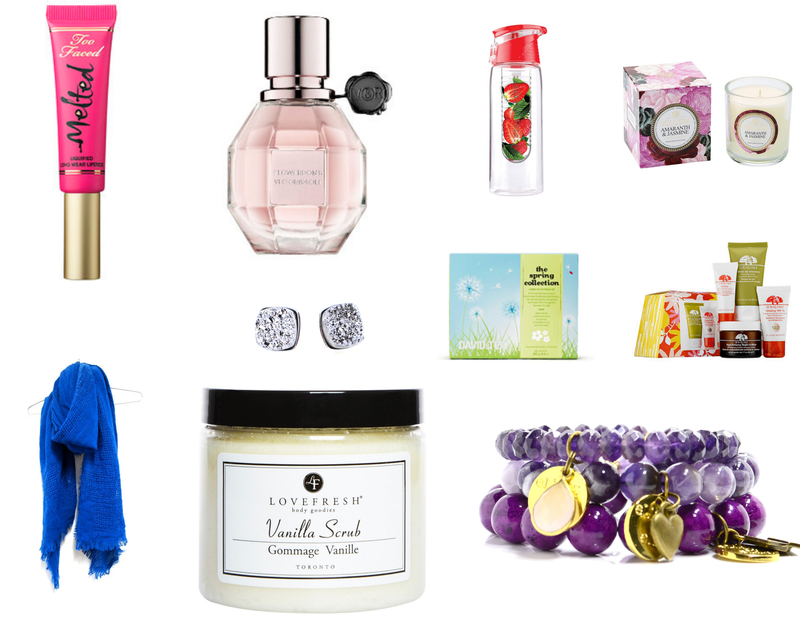 I wanted to do this little gift guide to say thank you to all moms because god knows they deserve it! No gift can every come close to compensating the gifts are mothers have shared with us, the lessons they have taught us and the love they have given us. They love without boundaries, unconditionally, sometimes to a fault haha and never give up on us even if we’ve given up on yourself! Moms, from all of us kids, THANK YOU!! Also stayed tuned in the next week or so for a fabulous giveaway that I have teamed up with Eliasz & Ella as well as Miss Boss to bring you ,to say thank you so so much for all of the support!!! Liquid Lipstick by Too Faced: This lovely lipstick literally comes in a zillion colours and will be sure to compliment any skin tone or colour palette that suits your mama! Eliasz & Ella Jewelry: You all know this is my go to jewelry line not only because their stuff is fab and they are designed right here in Edmonton but the fact that they make THE perfect gift!! This fab jewelry can be purchased online on the Eliasz & Ella website or at Miss Boss! Origins Rest & Recharge Mother’s Day Set: I lovvve origins skin care and this little kit would be a perfect gift to show your mom the appreciation she deserves! The kit includes the Energy-Boosting Moisturizer, Mineral-Enriched Renewal Cream, Refreshing Eye Cream, and the Intensive Overnight Mask! Jackson Rowe Olive Scarf: I lovvvvve Jackson Rowe, it is probably my new favourite brand for the summer! These scarfs are to dye for, super soft and would compliment any outfit as it comes in 8 different colours! Can be purchased at Miss Boss here in Edmonton, or on their online store! Flavor It To Go Water Bottle: These babies are the bomb, I lovvve putting fruit in my water and this little bottle compliments that so well! Tip: Freeze your lemons, limes, oranges etc so they act as a ice cube as well as a zing of flavour!! Can be bought at Chapters! David Tea for Mom: Who doesn’t love David’s Tea! This little set is perfect for the tea loving mom! This little sampler includes Serenity Now, Vanilla Rose and Mother’s Little Helper! Voluspa Amaranth & Jasmin Candle: I love candles and this little boxed candle smells delightful and would be a perfect compliment to a warm bath! I get these babies from Chapters in store or online! Love Fresh Vanilla Scrub: This all natural scrub is gentle enough to use as a daily exfoliant and the sent… ugh solo good although i am a sucker for Vanilla! This line is awesome and can be purchased at Miss Boss here in Edmonton! Viktor & Rolf Flowerbomb Perfume: I love a good smelling perfume and this one is heaven in a bottle. It is not overpowering or strong, it is a beautiful soft floral sent that smells better as you wear it! This little bomb can be purchased at Sephora or at their online website!